Say, did you hear the one about the definition of a Yankee? This aphorism is ascribed to E. B. White, though some credit the punch line to Robert Frost. I’m not sure who said it first, but I do know that by that definition, there are very few Yankees left. Perhaps, for good reason. The tradition of pie for breakfast is a farm tradition, where breakfast was served after the morning chores were done. "The man who enjoyed a slab of pie at seven-thirty had been up milking cows since four o'clock," wrote Louise Andrews Kent of Calais, who wrote cookbooks and articles for Vermont Life under the name of Mrs. Appleyard. "He had already done what most men would consider a day's work, and he would still be working 12 hours later." And, if most men today aren’t up at 4:00 a.m. doing chores any more, most women aren’t getting up with their men at that time either, to stoke the cookstove, make the coffee, and get the breakfast ready for the family and any hired help. Both the decline in the farm culture and the women’s movement has changed all that. Double-crusted fruit pies are the traditional breakfast pie, in part because they could be served hot fresh out of the oven, or reheated after sitting in a pie safe for the better part of a week. Pies were made assembly-line fashion in the farm kitchen and enough were made at a time to last the week. According the American Pie Council, a Vermont housewife, itemizing her baking for the year 1877, counted her yearly total as 421 pies (plus 152 cakes and 2,140 doughnuts). Does anyone have pie for breakfast anymore? According to a 2008 survey conducted by Crisco and the American Pie Council, 35 percent of Americans say they’ve had pies for breakfast. Ask around Vermont and just about everyone has had pie for breakfast one time or another; they just don’t make a regular habit of it any more. It’s blueberry season right now and music festival season. Dinners are scattered affairs; our schedules are fractured. So when our son Sam arrived with 4½ pounds of tiny wild blueberries that he had foraged, pie for breakfast sounded ideal. I needed a recipe that wouldn’t mask the delicate flavor of the wild berries, so I made the Fresh Blueberry Pie from 250 Treasured Country Desserts, which I wrote with Fran Raboff a few years ago. The recipe calls for 3 cups of fresh berries lining the crust, with a glaze of 1 cup cooked berries. The glaze seeps in between the fresh berries and holds it all together – just barely. The flavor is pure fresh berries, slightly enhanced. A dollop of whipped cream on top does no harm. Here’s the recipe. Breakfast, lunch, dinner, or coffee break. It’s a fine way to enjoy this season’s fresh blueberries. The deep blue berries glisten under a glaze of blueberries. The fresh flavor of the berries are undiminished in this delicious pie. Rinse and thoroughly drain the blueberries. Spread 3 cups of the berries on a towel to dry while you prepare the glaze. Set aside 1 cup of the berries. Combine 3/4 cup of the water and sugar in a small saucepan. Bring to a boil, decrease the heat to medium, and cook, stirring, until the sugar dissolves. Add the 1 cup blueberries, lemon zest, and lemon juice. Dissolve the cornstarch in the remaining 1/4 cup water. Add to the berry mixture and cook, stirring, until the mixture boils; the liquid will thicken and clear, becoming somewhat transparent. 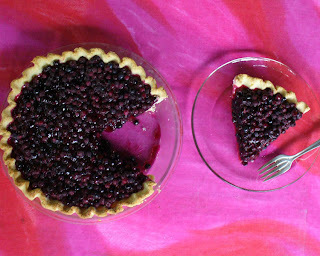 Spread the 3 cups of uncooked blueberries in the pie shell. Spoon the thickened berry glaze mixture over the fruit. Chill until served. Serve with whipped cream or ice cream. Andrea Chesman is a food writer and author of many cookbooks, including Serving Up The Harvest, Recipes from the Root Cellar, Mom’s Best One-Dish Suppers, and Pickles and Relishes and is coauthor of Mom’s Best Desserts and The Classic Zucchini Cookbook from Storey Publishing. She has also written and edited numerous additional cooking, food, and garden publications. Andrea Chesman lives in a historic farmhouse in Ripton, Vermont, where the poet Robert Frost boarded. She lives with her husband and two sons. When she is not at work on a writing project, she edits and indexes cookbooks for numerous publishers. xigokkWhat a great custom! And, I've eaten pie for many a breakfast. Regarding Yankees, here's a story that tickles my funny bone, told by a German woman who moved here from California and now lives just down the road. One day she stopped to chat with a neighbor who was fixing his fences and he told her, "Arkansas was a free-range state until you Yankees moved in and messed that up!" So apparently you can be German and a Yankee in Arkansas. Your post got me hankering for blueberry pie so I got some berries from the farmers' market today and made your recipe. Yum! Although I used fresh zest and juice from the lemons in my backyard and it was a bit overpowering... I think I'd half those ingredients if I made it again. Today is the last day of my vacation with my wife's family, and we're down to slim-pickings in the condo's kitchen. When I offered my daughters left-over pie for breakfast, my mother-in-law (from Missouri) looked at me like I had three heads. To me, eating pie for breakfast seems like such a natural thing, but I couldn't articulate why. I bet your daughters were thrilled with the Yankee pie-for-breakfast custom!